Choosing the junk removal truck and truck body for your new junk removal business is one of the most important choices you will make. Your decision will mainly depend on your budget and your credit score. Since these blogs are aimed at providing relevant information for prospective and current junk removal business owners of all backgrounds, ages, and net worths, we will provide info on all of the different choices. 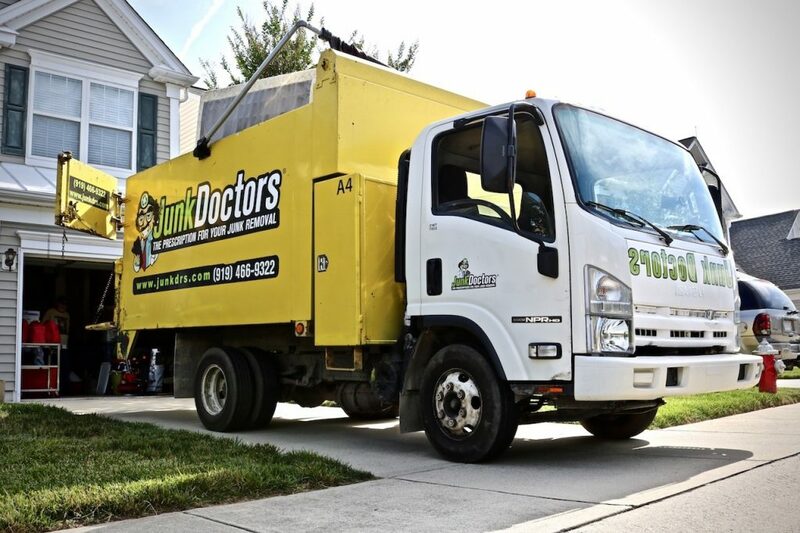 As we built Junk Doctors, we bought mostly used junk removal trucks. However, more recently we have purchased new trucks and installed our own superior custom truck bodies. The cheapest option is going with a pickup truck and trailer. For those of you who are strapped for cash and have bad credit or no credit history, this will be the route you must take. You can find a decent pickup truck for about $6,000 and purchase a trailer for about $1,500. There are many cons to taking the trailer route, however. I should know. That’s how we started Junk Doctors. The first downside to using a trailer is the fact that you have to hand unload everything. That means once the truck is loaded, the job is only halfway done. You must hand unload at donation centers, recycling centers, transfer stations, or landfills. Trucks and trailers are also harder to back. This becomes a big issue if and when you start to hire people. Many prospects in our labor pool will not know how to back a trailer. Or worse, they’ll say they know how to and then run into something. Secondly, the signage is not nearly as noticeable on your trailer, so you get fewer jobs from people seeing the truck. Finally, people will not take you as seriously or believe you are able to haul as much stuff. There is nothing more deflating than getting to a customer’s home and hearing them say, “oh, I thought you had a big truck.” But if that is your financial situation, then this is what you’ll have to do for the time being. Focus on making as much money as you can as quickly as you can so you can upgrade your truck. The next option you have is purchasing an old used box truck. Old U-Haul, Budget, Ryder, and other rental trucks can be purchased for $10,000 to $15,000. The box truck is just a slight upgrade from the truck and trailer. You can have large graphics installed and the truck looks professional to your customers. But you still have to hand unload anywhere you go. A box truck is nice for donations as it keeps everything dry. Several junk removal companies actually have a box truck in addition to a dump truck just for donations. That is probably the only time you should buy a box truck – as a support vehicle for your dump trucks. If you can’t afford a dump truck, start with a truck and trailer and upgrade to a dump truck ASAP. 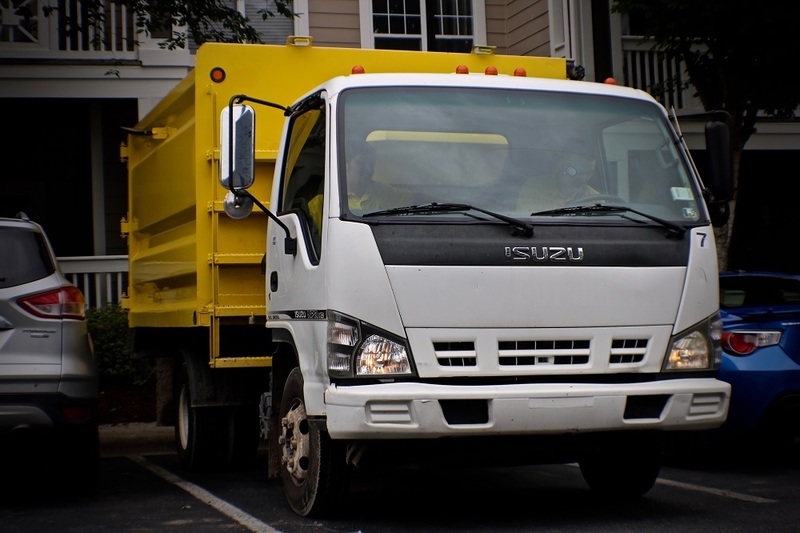 Used dump trucks for the junk removal industry are just a bit more than the box truck and will quickly pay for themselves in increased labor efficiency. Option #3 is to purchase a used junk removal dump truck. You can normally find a decent Got Junk truck every week or so on either Truckpaper.com or commercialtrucktrader.com. It’s also worthwhile to look on Craigslist. Searching seartchtempest.com expedites searching through Craigslist. If possible, avoid trucks that have been up north or in coastal areas. We have bought our share of trucks from those environments and the rust makes maintenance costs much higher. Stuff might not break more easily, but when it comes time to fix things, bolts, fittings, clamps, and more break from being frozen by rust. It increases the repair time of the vehicle and drives up costs of parts. However, the majority of used Got Junk trucks will be found in northern environments. When looking at used Got Junk trucks, you will either be looking at an Isuzu NPR or a GMC W4500. They are the same truck! There is no difference other than the fact that one says “Isuzu” and one says “GMC.” Generally, if you are going to buy used we recommend purchasing a truck that is between the model years of 2005 and 2007. The 2005 model was the first year of the 4HK1 engine. This engine has more power than its predecessor, the 4HE1, and many of the parts are much cheaper (though still expensive). For example, a fuel pump for a 4HK1 is around $1,400, while one for a 2004 or older model is around $4,000. We do recommend pre-2008 vehicles if possible because they did not have the Diesel Particulate Filter (DPF) system. DPF systems vastly increase maintenance costs as they age. They also have some specific operating instructions that many junk removal team members will not understand. 2012 and later models use Diesel Exhaust Fluid (DEF), which has to be refilled often. The DEF tank is also a potential area for inexperienced drivers to do a huge amount of damage to your vehicle by adding fuel to the DEF tank and not the fuel tank. This repair, should it happen, will cost about $6,000. The 2007 and older models were also lighter in weight. The 2008 and newer models are more comfortable, but with the added comfort came increased weight, which decreased payload weight for your trucks. When you buy a used truck, it’s a good idea to invest in new paint and graphics. They’re a great source of advertising for your business. When inspecting your prospective used junk removal truck, the first thing to do is look underneath for leaks. Then pull the dipstick and make sure the oil level is good. Pull the dipstick for the transmission fluid and make sure the fluid doesn’t smell extremely burnt. It isn’t uncommon to have a slight burn smell, but it shouldn’t be overpowering. Look at the fuel filter, oil filter, and transmission oil filters to see if it looks like the filters have been recently changed. Raise the bed with the engine off. It should sound smooth going up and down. You shouldn’t hear any groans. Check the grease fittings to see if any grease is coming out of them or if they look dry and ungreased. Look at the frame and the screws, bolts, and fittings that hold things on. Are they very rusty? Raise the cab. Check and see if any of those clamps or hardware look rusty. Finally, crank up the truck. Does it crank right up? Listen for clanging sounds coming from the engine. We purchased our second NPR in 2013, and the engine went out after we had put about 20,000 miles on it. We had heard a “clanging” sound for quite some time now and had figured it was normal for the 4HK1 engine. We were wrong. Part of the valve train came apart and that engine had to be replaced. It is about $7,000 to have a new engine put in your truck. If the engine sounds like it runs well and all the lights on the dash are off then you will want to test drive it. When driving, check for play in the steering wheel, ensure the brakes work correctly, and make sure the truck accelerates smoothly. NPR’s can comfortably run about 65 MPH. If these checks all go well then you could have a good truck. You should be able to find a decent Got Junk truck for about $20,000 to $25,000 at around 90,000 to 120,000 miles. The final option you have is to buy a dump truck brand new and install your choice of truck body. You can go to your local Isuzu dealer and order the truck. We strongly recommend Isuzu NRR trucks. We are one of the few that do. The NRR’s have a 19,500 Gross Vehicle Weight Rating (GVWR) compared to an NPR, which has 14,500 GVWR. Basically, an NRR can haul 5,000 pounds more than an NPR. It can do that because the suspension and brakes are more heavy duty. From experience we have learned that NRR’s also have lower maintenance costs. Brakes last twice as long on an NRR because they are larger. And it is much easier to keep from overloading an NRR. You will often be operating an NPR overweight. This is both illegal and unsafe. The NRR is about $5,000 more up front, but you will likely be financing or leasing it anyway, so your monthly payment will only be marginally higher. It is definitely worth the increased cost. You are taking buying a junk removal truck seriously by doing your research. When you buy new you are also investing some serious money in a junk removal truck. Don’t skimp by getting a new NPR just to save a few thousand dollars – which is being financed over five or six years anyway. Get the right tool for the job and you will never regret it. When you order the truck from the dealer you will roll the body in with the financing of the truck. You can custom design your junk removal body, or you can talk to us for recommendations on where and how to purchase an optimal truck body. You might be wondering, “why use a Low Cab Forward truck like the Isuzu truck?” Maneuverability! Remember, most of your drivers will be inexperienced. Buy a truck that handles as well as an LCF, and the number of mailboxes they run over goes WAY down. The Ford, Chevy, and Dodge dump trucks with the long nose simply don’t have the turning radius or field of view of the Isuzu trucks. They’re all great brands, but they do not fit the type of workers you will typically have driving them. If at all possible, I would recommend either purchasing a used Got Junk truck or buying a new NRR with a custom truck body. It simply depends on your financial situation. If you can afford new, go with a new truck. That will give you the most “up-time” because your vehicle will not be getting repairs very often. And there is nothing worse then a truck going down when you don’t have another to take its place. Don’t give control away. Partner with JRA!